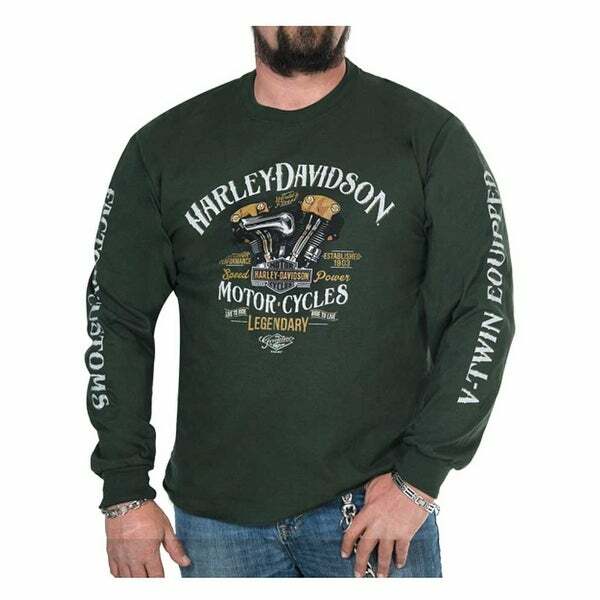 Harley-Davidson® Men's Righteous Long Sleeve Shirt - Forest Green, 30298479. High-quality custom v-twin graphic with distressed Harley-Davidson® script and a famous Bar & Shield logo. Bold 'Factory Customs' & 'V-Twin Equipped' screen printed down sleeves. Back features our Wisconsin Harley-Davidson Dealer logo. Classic crew-neck style, traditional comfort fit. Extremely soft long sleeve shirt, made from 100% cotton. This t-shirt has it all; comfort, quality and of course style! 30298479. I always order from this vender. The quality of their product is always excellent, delivery is always early and everything fits like it should Love, love love this vender!